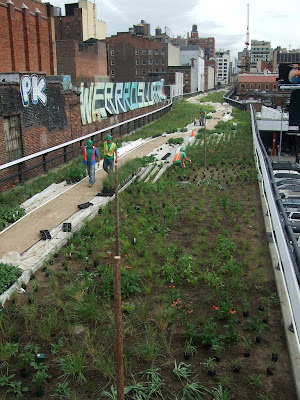 A very special urban park, called the Highline, was opened in New York last month. An ancient elevated railway was transformed into one long city-garden in the sky. This kind of projects - nature reclaiming its place in the city - make me feel so happy. The video tells the Higline story. 'Our' Dutch landscape architect Piet Oudolf was involved designing the plan. wow! I'd love that. I'll have to go to New York someday.